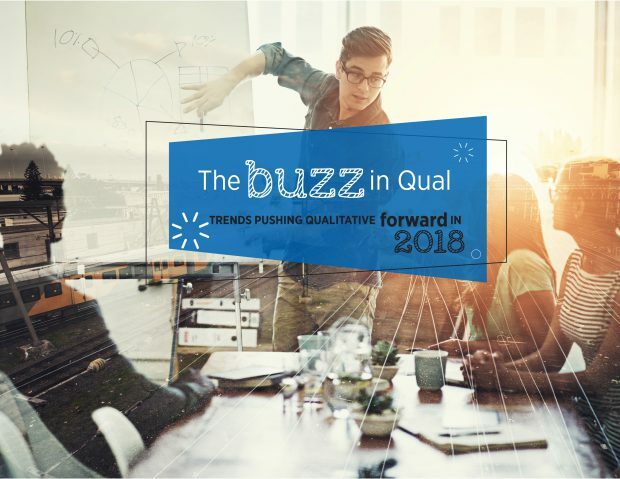 Qualitative research is celebrated for its unique ability to uncover needs, discover new insights, and highlight new opportunities that drive innovation. However, what is new in the space? And more importantly, how can it help organizations meet their research objectives? Here are a few methods and technologies that will help us get closer to the consumer to propel innovation – and bottom line results. The prevalence of passively collected biomarkers (face, voice, eyes, skin, heart and brainwaves) continues to increase. Biomarkers such as skin quality/temperature scans, eye tracking, and neuro-tracking, can be used on product testing, concept development, virtual store shopping, etc. and leveraged as powerful stimuli to fuel fruitful and more candid dialogue. The real power in these techniques is revealed during qualitative exploration of one’s own results. Imagine conducting eye-tracking research with your target customer and learning exactly what draws their attention and the order in which they consume your message on a magazine spread, restaurant menu, or advertisement. This information allows brands to place highly engaging and motivating content in the locations best suited to boost awareness, trial and purchase. Wider use of social media analytics to detect sentiment, passion, and thematic content continues to find its most productive home within the insights mix. Though social media data is unstructured and more difficult to measure, consumers are proactively offering passionate dialogue about their needs and experiences in a wide array of categories. In the year ahead, continue to see increased triangulation of social media and traditional research data. In addition, talking with consumers in the moment via research triggered by geo-location or push notifications is gaining traction. This can include surveys, open ended qualitative exploration or digital ethnography sessions. Imagine talking to a consumer as they enter a specific retailer and learning more about their current shopping experience and the influences on purchase behavior, or conducting an exit interview to more fully understand an impulse purchase at check out. This information provides first-hand insight in real-time on your consumer’s experience. Stepping beyond the traditional to observe how consumers behave in real-time, virtual reality presents a unique opportunity for qualitative research which allows us to study a specific audience in a specific setting. With the advancement of technology over the past few years, VR has become a reality in mainstream research settings and, in some cases, offers a more practical approach to the logistics involved in the observation of live research. Virtual reality tools can bring multiple stores or concepts to the respondent in one location, whether at a facility or online, while also providing a truly immersive experience for the respondent. Virtual reality can be used either as a standalone tool, or in conjunction with shop-a-longs and product ideation sessions. Variables, such as packaging, price, product assortment, and shelf organization, can be tweaked as the research evolves. This allows the team to pivot in real-time as feedback is received from consumers. Imagine watching your consumer shop at shelf for your product, amongst all the noise of competitive products, and then having an engaging conversation with them to understand what influenced their choice(s). Through immersion and deep-dive ethnographies, we can better observe in-the-moment behaviors of consumers or professionals, either virtually or physically. This focus on the personal dimension allows us to truly experience their day with them and gain valuable insight into the conditions/situations in which products and services are used. This helps create a culture of empathy and allows us to break down the walls of unknown and step into the known. Imagine you are with a customer as they check their pantry, cut their coupons, create lists, and shop. This type of immersion allows you to fully experience the consumer’s situation and mind-set. It also provides vital insight to the client and an in-depth look into the consumer: why the consumer is (or isn’t) brand loyal, potential budget constraints, how product placement influences or changes their shopping behavior. Spending time with a professional customer in their office or work-site can give the client a glimpse into the processes, such as ordering supplies, vendor decisions, budget creation, outside influences, and helps illuminate office dynamics and the customer’s company structure. This helps make innovation more on target for future ad concepts, new products and client relationships. Consumer behavior is a moving target impacted by technology, social influences, and globalization that can be challenging for even the most established brands. Through the creation of an expert panel comprised of key consumers, brand teams can turn to consumers on a consistent basis for input, opinions, and ideas. This can be done in a variety of ways including activities and conversation via an online panel that is engaging and iterative, fueling conversation and learning for the brand team. In addition, immersive and multimedia tools such as Pinterest boards, Instagram accounts, video diaries, online collages, Skype sessions, etc., can be leveraged on a single study or over time, to gain in-depth, multi-faceted and honest feedback only possible in a fully engaged expert community setting. The insights gained from these consumers who have stake in the brand, can be used as a springboard to develop new ideas, concepts and products, and identify whitespace which can then be tested and validated to grow the brand. Imagine spending six weeks with consumers who have a chronic illness. You gain a deep understanding of their daily routine, how they manage their illness, and how they feel about life with their condition. All of this insight and experience can serve as the foundational learning and influence future communication strategy to more closely resonate with – and potentially motivate – this key demographic. One thing is certain across all emerging trends in Qualitative: the consumer is still and will remain at the forefront. Consumer-centric thinking and research design will guide how companies conduct qualitative research in 2018 and beyond. As a key member in Qualitative Services , Krissy Polley is responsible for the design and management of qualitative projects. In addition, she regularly consults on projects and stays abreast of the latest trends and technologies within the industry to better serve Burke clients.